May I have an art proof before ordering? What is the minimum quantity and item color splits? May I request an item sample? I received an email coupon. May I combine offers? What if my items arrive broken, damaged or misprinted? Is RUSH production or delivery available? Do you ship to APO (Army Post Office)? May I split imprint colors or designs? May I use a trademark or copyrighted logo? If I place a re-order will I have to pay the screen charge again? May I use my own design? Click any question for its answer. Please be sure to enter a valid email address and check for your art proof thoroughly to prevent delays: when in doubt, email any questions to your artist (or call). NOTE: Make sure to check all of your filtered email folders (junk, bulk, and spam). We cannot proceed with printing until you approve. No. We do not charge art fees; therefore, we require an order before providing an art proof. Every order processed receives an email art proof within 1 to 2 business days that must be approved—via email—before the order is sent to production. WE DO NOT PROVIDE ART PROOFS BEFORE ORDER PLACEMENT. By Credit Card: all orders are securely processed through a nationwide credit card processor. We use "Green Bar" extended validation (EV) for your protection with the strongest encryption available in our certificate. By Check: a Customer Service Representative must assist you. Please call 1-800-939-1980. Note: Your order will not be processed until payment is received. Your new, estimated delivery date will be computed at that time and a receipt showing the date will be emailed to the address provided at checkout. The minimum quantity and item color splits (1 to 4) vary from item to item. For your convenience, the minimum quantity is pre-filled in the first (top) quantity input box (100 pieces, in this case). Each split total (50, in this example) must exceed the minimum split quantity (see “Product Details”, below), and the total of all splits (150) must meet or exceed the minimum item quantity (100). 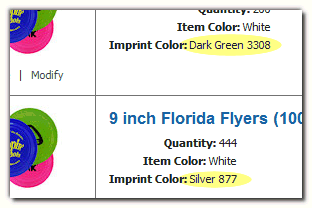 Note: Any “Item Color” drop-downs exceeding the splits maximum are disabled automatically. and customer added minimum split quantity (50). Below the “Item Editor” is the “Product Details” block showing the attributes that apply to the item. Here you will find the minimum item color split quantity (50) and the maximum number of item color splits (4). “Product Details” block showing per split minimum (50) and maximum item color splits (4). Yes. Random item samples are available so you can examine quality and color. We encourage you to take advantage of this service: the cost is just $5.99 per sample and the shipping is FREE. 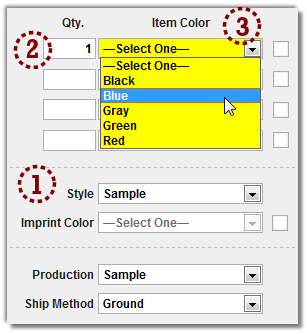 To order a sample, 1) select “Sample“ from the “Style” drop-down, 2) enter a quantity (defaults to 1), and 3) select an item color. “Item Editor” showing a random sample entry. Note: Random samples and other quantities are mutually exclusive and cannot be combined on a single item. 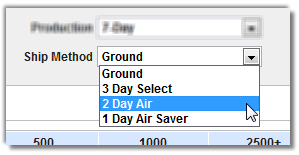 To cancel the sample and reset the form, select another style from the drop-down. No. Coupons and sales are mutually exclusive and cannot be combined. We encourage you to "do the math" and select the offer (coupon or sale) that saves you the most at the time of purchase. If an order is not well received—either due to a typo or other issues—please contact our Customer Service Department at 1-800-939-1980 within 7 days of receipt of goods. DO NOT DISCARD DEFECTIVE OR DAMAGED MERCHANDISE. We cannot resell an item that has been personalized to your requirements. There are absolutely no returns after 30 days of reception of your order. See "Terms" below for our complete return policy. Depends. Our “Rush Service” (production and shipping) is generally available on most items. Note: unavailable options will be grayed-out. “Item Editor” showing the “Production” options. “Item Editor” showing the “Ship Method” options. All orders are shipped standard delivery by the carrier of our choice. Our shipping software shops rates on every single order shipped to give you the best rates between Fed Ex and UPS. If expedited shipping is needed to meet a deadline, please contact a Customer Service Representative for details @ 1-800-939-1980. No. This policy has been implemented to prevent fraudulent shipping claims. No. We only ship within the continental United States. No. We require a physical shipping address for all orders. No. Unfortunately we cannot deliver orders to APO's at this time. Yes. 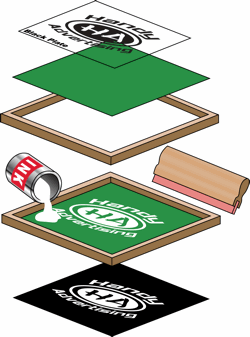 Each item must consist of the same imprint color and design. So, if a different imprint color or design is required, simply configure a second, identical item to accommodate the necessary changes. Yes, upon condition. All trademarks show on DiscountFavors's sample items are for visual illustration only. We do not own the rights to these logos. To use a trademarked logo, we require that you have written approval on company letterhead and that you understand you are solely liable for any infringements. A screen charge includes the cost of creating and "burning" a screen which will be used to print your design. Charging such fees complies with the industry standard. No. You will not be assessed a screen charge fee if a re-order is placed for exactly the same item and design. Our Customer Service Representatives will be happy to provide you with tracking information on your order. Please call 1-800-939-1980 for details. Yes. You may upload art during the order process. Additionally, we provide free clipart and font galleries. Adobe Illustrator (8.0 - CS4) .EPS or .AI files. These file types are highly preferred. Adobe Photoshop (300 dpi +) .PSD files. High resolution (300 dpi +) JPG or TIFF files or PDF files. Yes. After the date and time the first proof is SENT to your inbox, there is a $25.00 cancelation fee if an order is canceled. This rule applies to normal production orders only. There are NO cancelations for any rush orders. NOTE: Our order process is fast (our production line works seven (7) days a week in order to meet our customers’ timelines).